يشكل فندق شقق مانترا أون موراي بموقعه الممتاز في منطقة مطاعم, سياحة, تسوق ضمن المدينة، مكاناً ملائماً لقضاء العطلة بعيداً عن عجقة أيام العمل. يسهل الوصول إلى هذا الفندق ذو 4 نجوم من المطار، فهو يبعد عنه مسافة 32 km فقط. يوجد العديد من المعالم السياحية الأكثر جذبًا للسياح في هذه المنطقة. إن شقق مانترا أون موراي حريص على توفير الراحة للنزلاء، فلا يوفر الموظفون جهداً في تقديم أفضل الخدمات وضمان حسن الاستقبال. يقدم العقار خدمة الغرف على مدار الساعة, مكتب الاستقبال على مدار الساعة, مرافق مخصصة لذوي الاحتياجات الخاصة, تسجيل وصول/خروج سريع, تخزين الأمتعة لضمان الراحة القصوى لضيوفه. في شقق مانترا أون موراي غرف نوم يزيد عددها عن 190 صممت بذوق وعناية لتوفر لك كل وسائل الراحة . بعضها يحتوي أيضاً على تلفزيون بشاشة مسطحة, بياضات, مرآة, مناشف, اتصال لاسلكي بالإنترنت. يمكنك طلب اللائحة الكاملة للخدمات في الفندق ومن بينها مركز للياقة البدنية, حمام سباحة داخلي, تدليك, حديقة. إن كنت تتطلع إلى إقامة مريحة وهادئة في المدينة، فستجد في شقق مانترا أون موراي بيتك الثاني. تتوفر خدمة الواي فاي/الإنترنت في مكان الإقامة مقابل رسم إضافي بقيمة 10 دولار أسترالي في اليوم الواحد. Hotel is situated in an excellent area. The room was spacious. Staff friendly and helpful. Nice little snack at happy hour. Good breakfast. Will definitely stay there again if I get another good deal. On the day to check in, James is very nice provide us with a map on the free bus service with those sightseeing. When check out, checking from the counter the transportation to airport, they provide us with a clear information slip with the location pickup and fare which is very good for our travellers. Thumbs up for their service. CBD area very convenient. 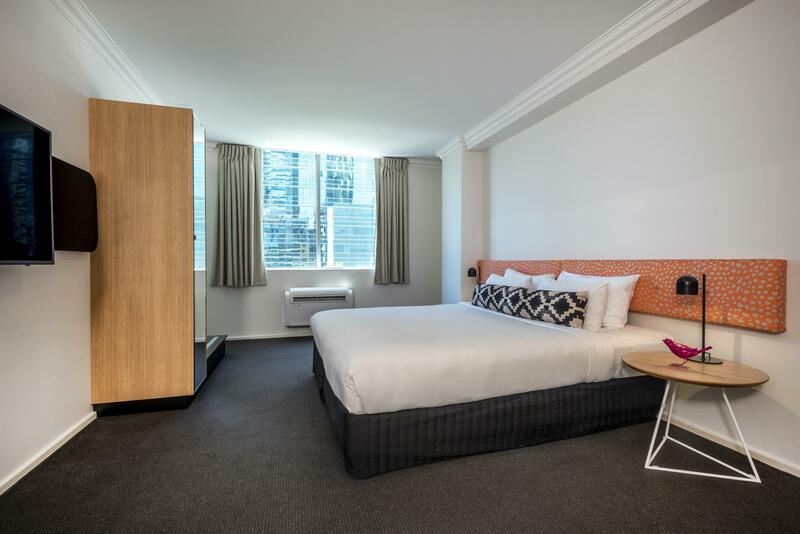 This hotel is in the best location in Perth CBD and with spacious rooms - highly recommend! Everything was perfect. The room condition, big room and bathroom, the location, the public transports are just in walking distance. Suitable for Muslim family, since, there are lots of halal restaurant nearby. There was this lady staff, Maria at the reception counter, she is very helpful and has a wonderful personality. Thank You Maria for your excellent service that make our 5 days 4 nights stay enjoyable. We will sure to stay again. 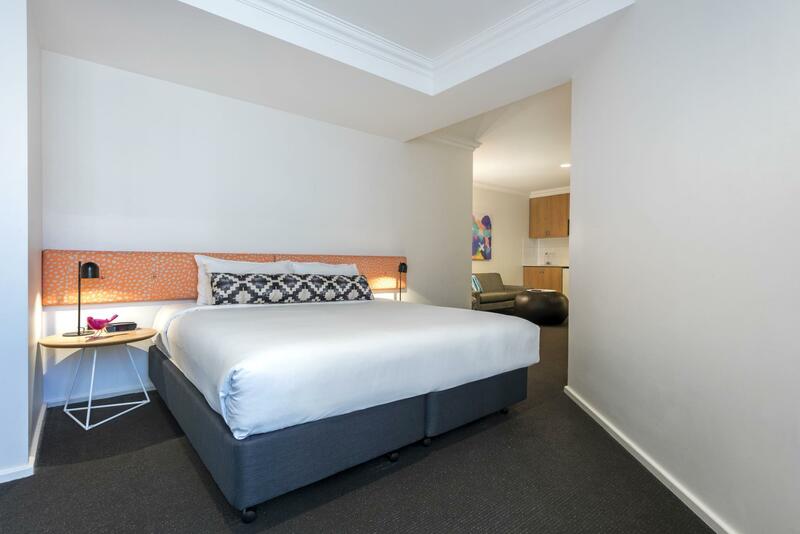 Overall the stay is good, location is a plus point, free Red CAT bus stop just in front of the hotel, many cafe & restaurant in the surrounding, few pubs opposite the hotel. Is good for those who love night life. The room is big, the king size bed is comfortable. The only problem is the sound proof and it will be very noisy at night due to the pub musci, especially during weekend. Stay was quite good, although I have one complaint about the airconditioning. Its surprisingly noisy and would go from quiet to really noisy during the middle of the night.it actually woke me up, wasn't very pleased with that. Tv was also a bit smaller than I would have liked, but definitely bearable. Other than that, it was a relatively nice stay with comfortable beds and a well equipped kitchen with dishwasher. We enjoyed our stay at the hotel and the minibar provisions were comprehsive. Fridge, kettle and two hob stove. More than enough considering the distance to so many dining options. 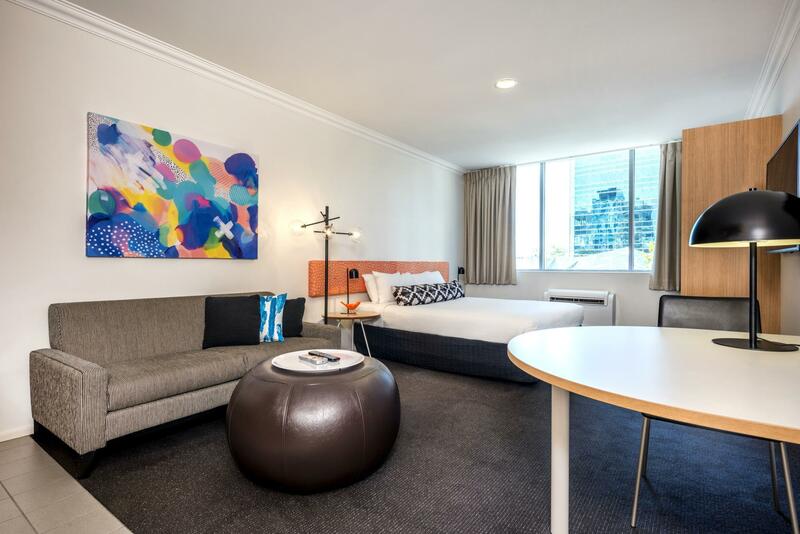 Fantastic location 2 minute walk from the main Perth train station and 10-15 minute walk to Northbridge the evening entertainment area. Staff were friendly and we accidentally got the buffet breakfast included, which was nice. Bit of a noisy bar opposite our window but this turned the music off at 1am. Aircon was effective and quiet enough. Shower over bath and decent size bathroom. All in all a good stay if you get a good deal. The hotel is centrally located. 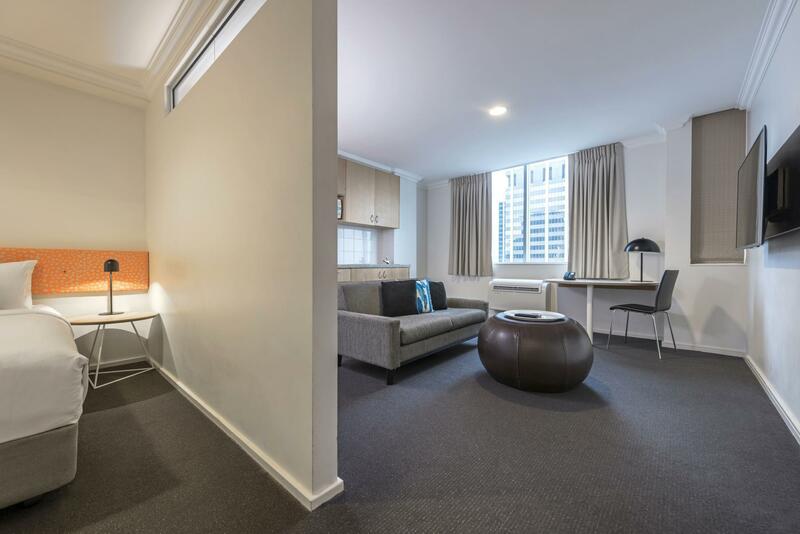 Close to shopping centre, food court, supermarket, train station and bus stops. My daughter missed her foods she always has in Sydney so we just grab the them from the supermarket and cook it in the hotel room (as it has facilities like an apartment ). Booked through Agoda, and luckily had a copy of the hotel voucher with us as upon arrival we were told there was no reservation for us. Fortunately 2 rooms were found for us (with an upgrade). 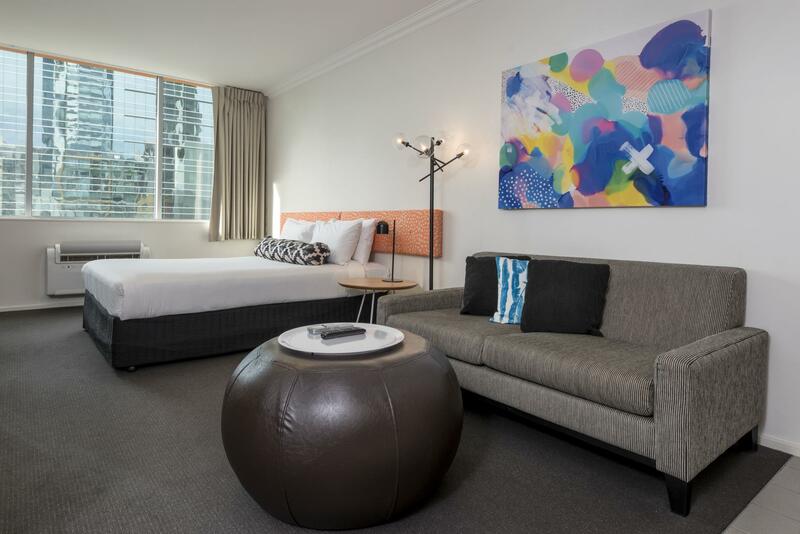 Would certainly stay at Mantra on Murray again if a discount to the full room rate was available. It is a first class property. The hotel room is big and fully equipped kitchen available. Very convenience location which is only 10 minutes walk to all tourist spot. The hotel should include breakfast as we booked King Studio and the breakfast is not included. The hotel shoudl provide Wiresless connectivity. it is very convenience to the train and bus station (around 5 minutes walk). you can also walk (around 10 minutes) to perth harbour (barrack jetty) where the ferry (cruise) to femantle, swan valley, rootness island, etc are available. 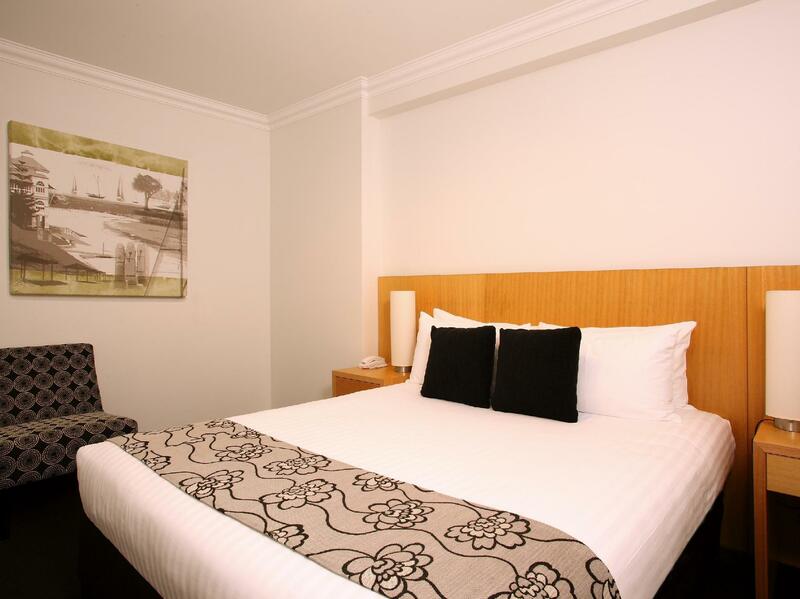 we booked king studio and th room is very big, nice bed, fully equipped kitchen, and friendly staff. we even allowed to checked in early at 6.30am without any additional charges. the hotel location is the best as it is located in the heart of the town and accessible to quite a number of tourist spots. My key card didn’t work two days, one day being New Year’s Day when I came back to the hotel at 1:30am and the staff at the front desk was not at all helpful! Asked me so many questions and made me look like an intruder. I was given another card which didn’t work either. I have stayed in many hotels in Europe, USA and Australia but your hotel staff was the worst I have encountered. This hotel was informed of my early morning arrival, 1:00am, the booking was created with the correct date, [after midnite]. The desk clerk insisted that my booking be changed, which was not required as the correct information was on their system. Due to the new booking I am out nearly $300.00. To much to put here it become very complicated. The desk clerk in the morning explained the manner with which I should have created the booking, the way she explained it was exactly the way I had created this booking. My first booking was $131.00 with breakfast, the booking created by the desk clerk in the early morning cost a further $289.00 with no breakfast. The booking was made using my card and booking through Booking.com without my permission. So poor the attitude, mannerisms, lack of knowledge and communication skills of staff is abhorrent . Bed and lounge was comfortable but the room had no clothing drawers and limited open hanging space. We stayed 8 nights and had to live out of our suitcases. Secure safe was in the bottom of the cabinet housing the ironing board and you had to get down on all fours to open and close the safe - not easy when your seventy.